Chabon, Mary. 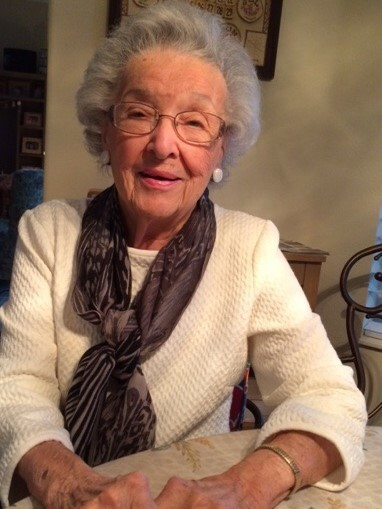 (nee Susylo), passed away on Wednesday, November 15, 2017 in Palm Coast, Florida. She was lovingly cared for by family throughout her last years. Mary was born in Middleport, PA to Simon and Anna and was the eldest of three children. She grew up surrounded by a large extended family whose gatherings included bounty from the seasonal home gardens and soul satisfying meals cooked on a coal stove at times. Mary graduated from Blythe Township High School where she nurtured along a love for the violin which she called “her fiddle.” Mary and her late husband William settled in Philadelphia, where they raised their three children and Mary worked as a seamstress. Throughout her working years she held the distinction of never stitching her finger on the commercial machinery. She was also active in the women’s Auxiliary at St. Josaphat Ukrainian Catholic Church in Philadelphia, PA.
Beloved wife of the late William M. Chabon. She is also preceded in death by her brother Andrew and she is survived by her dearest sister Sophie Kissel. Loving mother to Michele A. (Michael) Kennedy, Gerald J. (Carol) Chabon, and Mary Nicole Chabon (David Vlachos). She will also be missed by her grandchildren Joshua (Stephanie) Chabon, Ryan Chabon, Bart (Maren) Kennedy, Eric (Lauren) Chabon, Samantha Kennedy, and two great grandchildren, Baylee Raye Chabon and Theo Kennedy. There are a lifetime of memories to cherish…Thank you Mom. Relatives and friends are invited to Mary’s Viewing on Tuesday, November 21, 10 a.m., at Craft Funeral Home Erdenheim, 814 Bethlehem Pike, Glenside, PA 19038. Her Life Celebration will follow at 11 a.m.
Interment will be at St Mary’s Ukrainian Cemetery, Elkins Park, PA. In lieu of flowers contributions in Mary’s name may be made to Settlement Music School. Attn: Advancement Department, PO Box 63966, Philadelphia, PA 19147 or online at www.settlementmusic.org/give-now. Rest in Peace Mary – you will be missed by many.